creativeworks-studio.ca – This is the site for Creative Works Studio, an art studio for folks living with mental health challenges. This is the site for Creative Works Studio, an art studio for folks living with mental health challenges. 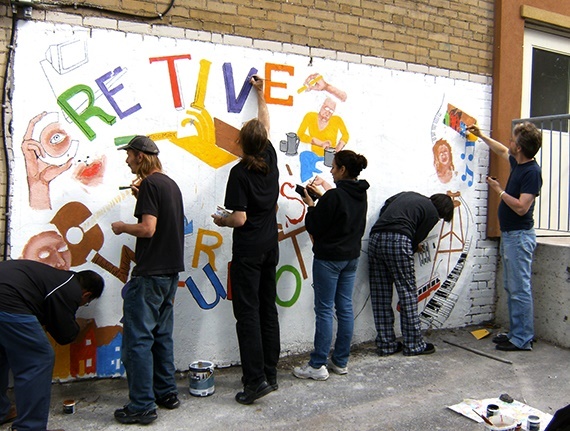 Creative Works Studio (CWS) is operated by Good Shepherd Non-Profit Homes Inc. in partnership with St. Michael’s Hospital. This community arts-based studio was founded in 1995 by Isabel Fryszberg, an occupational therapist and practicing artist with a vision that these two occupations could have significant benefit for persons living with mental illness and/or addictions. To that end, the Creative Works Studio’s mandate is to provide individuals living with mental illness and/or addictions a place to heal through the power of artistic expression. At CWS, each member is treated as an artist first and foremost. Members are encouraged to reach their greatest potential and skill level through purposeful and inspiring creative art initiatives. As a result of participating in the studio, members gain confidence and increase their sense of well-being while at the same time creating community within and outside of the studio. Returning to a meaningful and active life is the goal for everyone who participates in the program. CWS is actively involved in education, mental health research and community outreach as a means of disseminating information and reducing the stigma associated with mental illness and addiction. The Studio is open 5 days a week and accepts referrals from mental health agencies within the City of Toronto.